I have the blessing of living in a neighborhood filled with beautiful Victorian houses and every time I take a stroll, I always find new beauty on each house. A few weeks ago, while Simon and I were walking back home from a nearby restaurant, we were especially receptive to all the beautiful colored/stained glass windows some houses had. 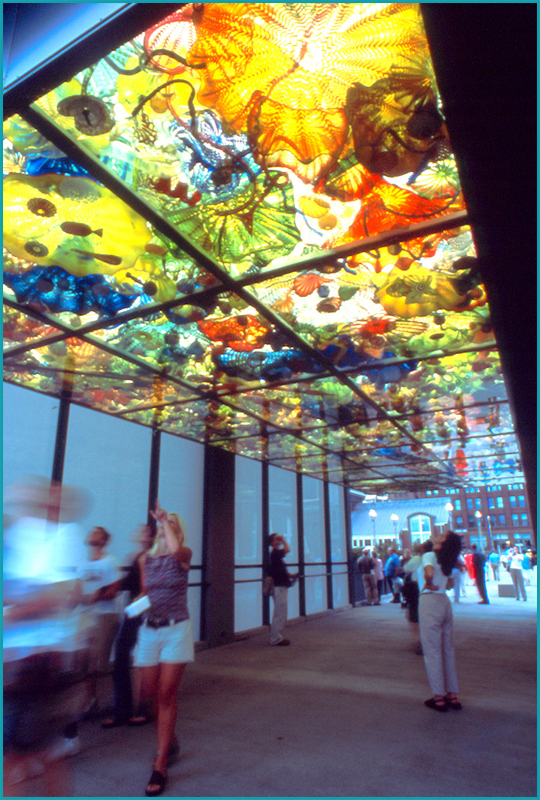 Instantly, Simon told me that I should make a blog post about colored glass in architecture. Here you have it. 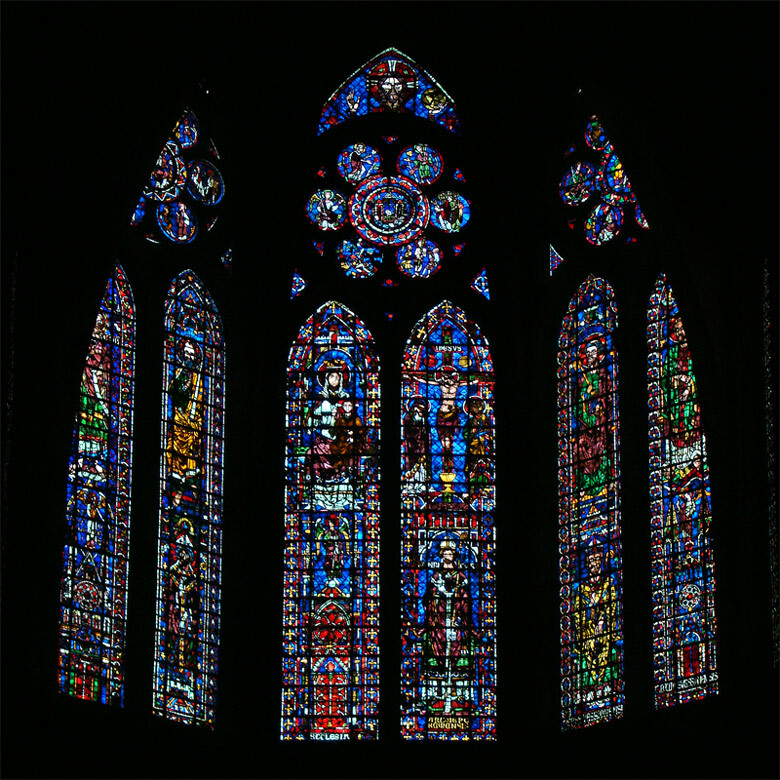 Some of the earlier versions of colored glass were in the form of stained glass at gothic churches in Europe. 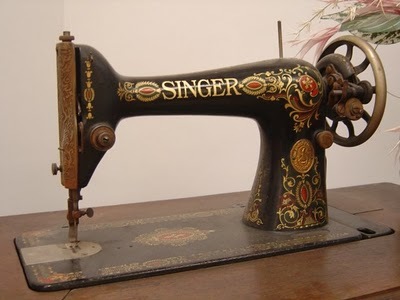 It was seen as a way for God to shower human beings with beauty and guarantee that parishioners kept on going to church. Stained glass at Notre-Dame de Reims Cathedral. One of the few places on earth that tears run down my face as soon as I walked in. Certainly God knew how to shower me with beauty that day. – Take note that it took almost 200 years to build this magnificent place. 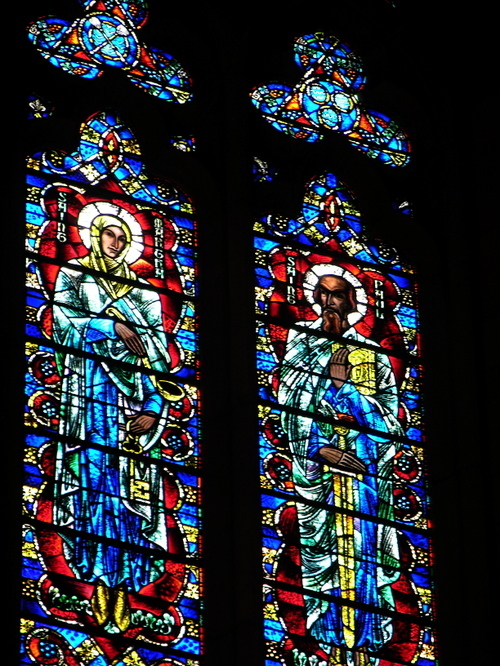 Beautiful stained glass at Grace Cathedral in San Francisco. A must place for visitors. 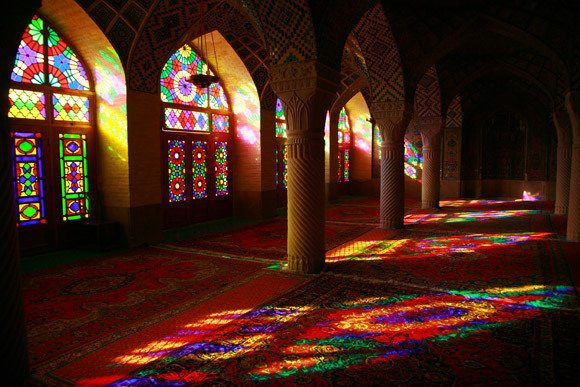 Colored glass was also used at mosques and other religious buildings around the world. 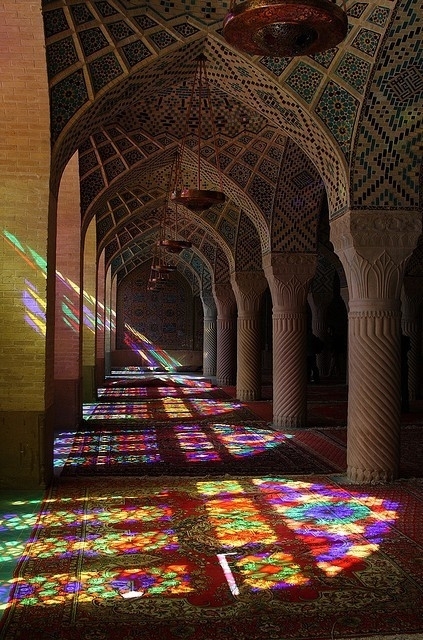 Vibrant colored glass at Nasir al-Mulk Mosque in Shiraz, Iran. Beautiful Middle Eastern architecture dancing with colors. Imagine walking down this hall. Being showered by the colors of Iran. Take note at the unique tile and rug work. 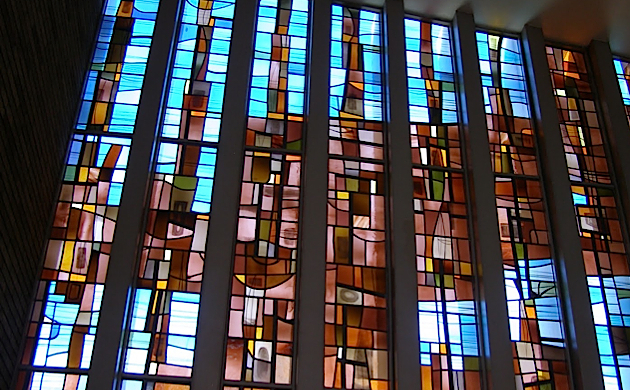 There are also more contemporary religious buildings where colored/stained glass is used in a more up to date form. Chapel windows by Jean-Jacques Duval at Jean-Jacques Duval’s Connecticut Synagogue. The beauty about stained glass is the fact that enhances space from big dimensions such churches to smaller places such houses. 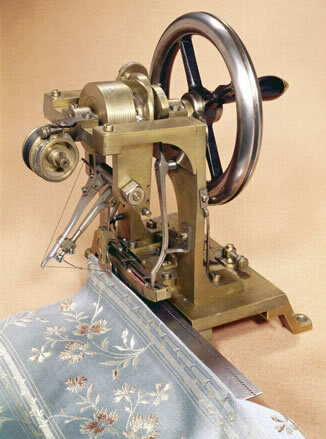 Small details such as this butterfly and three roses can make a small Victorian room the best place to hang out. Not only Victorian houses serve as good hosts for colored glass. More organic and contemporary houses are also good at that. 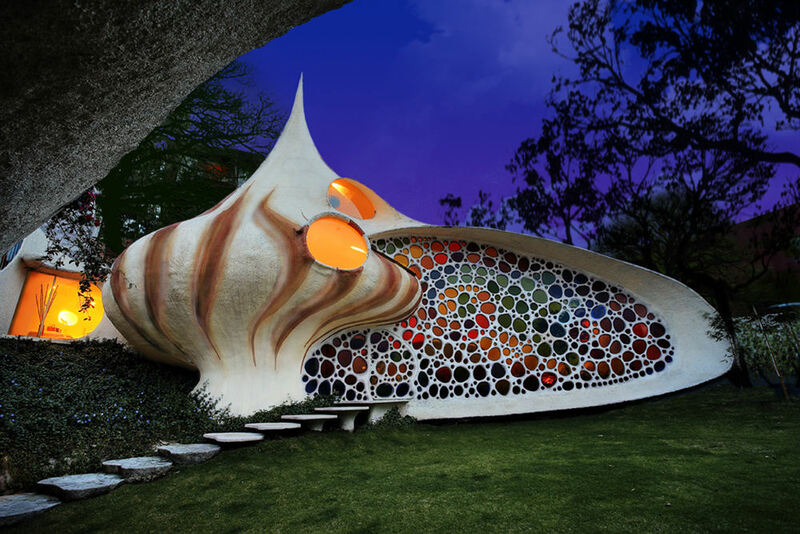 Nautilus House in Mexico City by architect Javier Senosiain. Inspired by the shape of a conch. 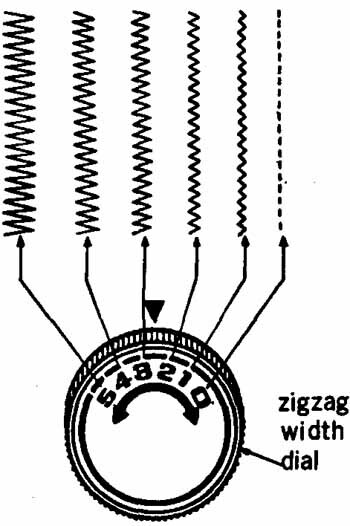 Talking about wonderful spaces to hang out. And talking about housing. 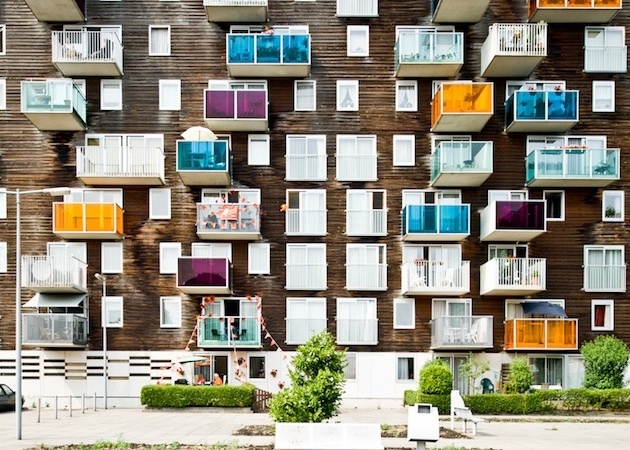 I personally would love to have a colored balcony when my body cannot be as adventurous. MVRDV’s WoZoCo 100 unit senior living facility matching up with the Dutch daylighting codes that are required throughout the country. 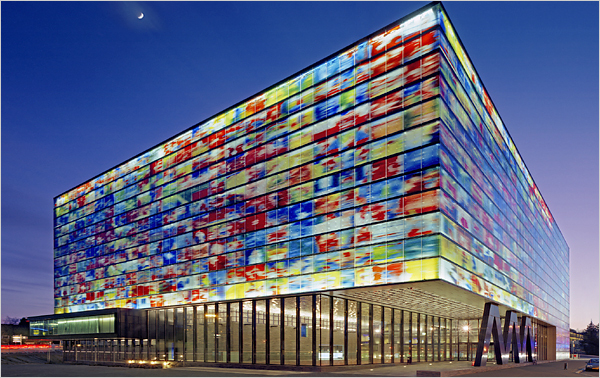 Colored glass is also famous among commercial architects, for human beings are universally attracted to transparencies and color. Here some shots at these buildings. Chihuly Bridge of Glass in Tacoma, Washington. Netherlands Institute for Sound and Vision by Willem Jan Neutelings and Michiel Riedijk … architects still relatively unknown in the United States. And no, they are not trying to clone Rem Koolhaas. 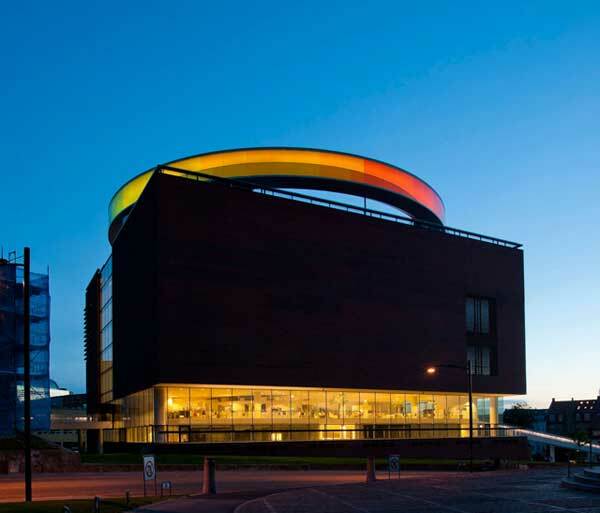 Your Rainbow Panorama Circular Pathway in Denmark . If you are thinking of the best place to take your tech/artsy date for a short stroll, this is it. 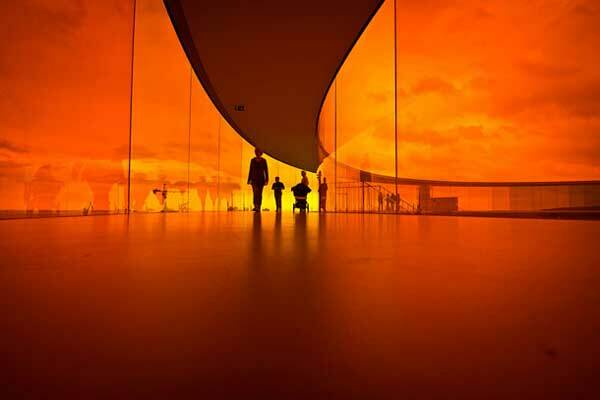 Resting atop the ARoS Aarhus Kunstmuseum, the fascinating colorful glass panoramic rooftop allows visitors to get a 360 degree view of the city. Well, hopefully when you are on your date, there are not as many people. And here is where you kiss! 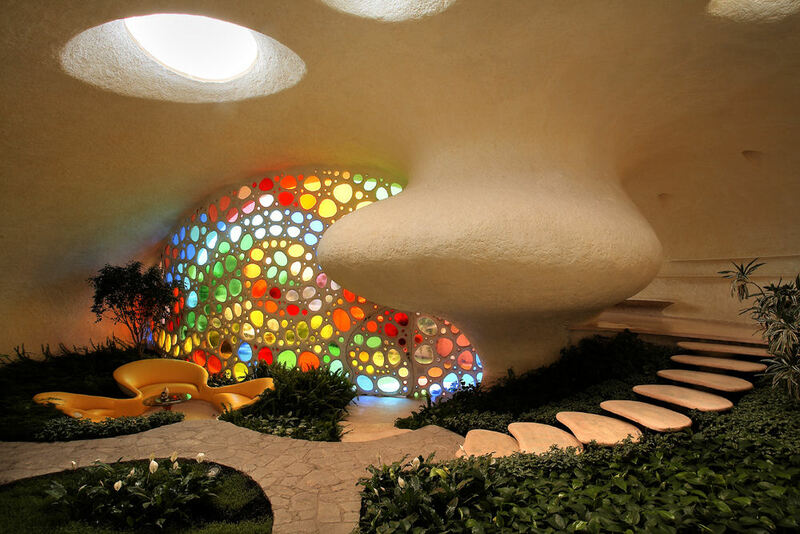 … Designed by Schmidt Hammer Lassen Architects, who were inspired by Dante’s “Divine Comedy”. Not only glass can be colored. Plexiglass also serves as a wonderful surface for color. 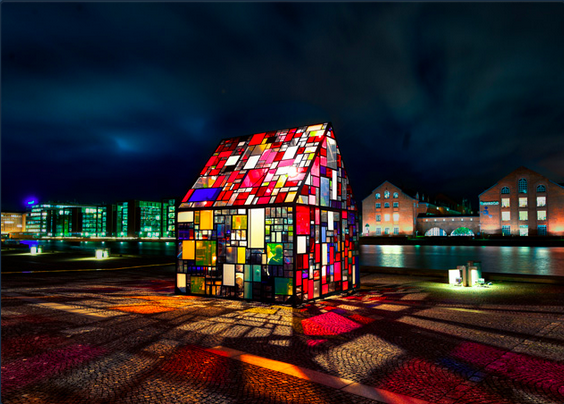 “Kolonihavehus” by NY-based artist Tom Fruin is an outdoor sculpture made out of thousand pieces of found plexiglass. 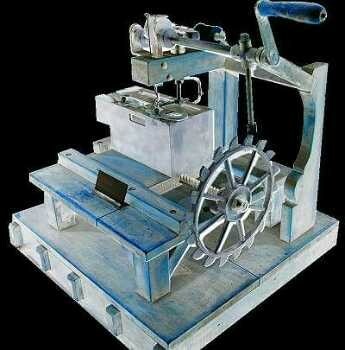 The piece resides in the open plaza of the Royal Danish Library in Copenhagen. Now this is a structure that aims at interior and exterior lovers at the same time. 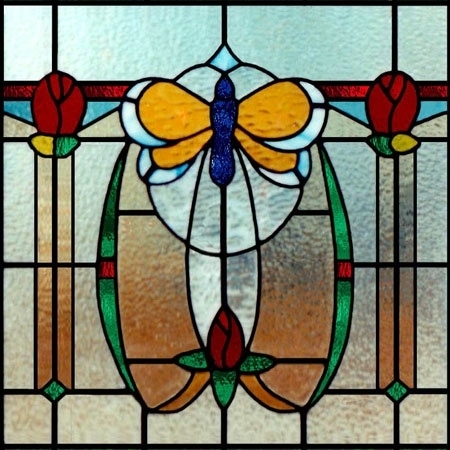 Stained glass can beautify spaces even in small dozes. 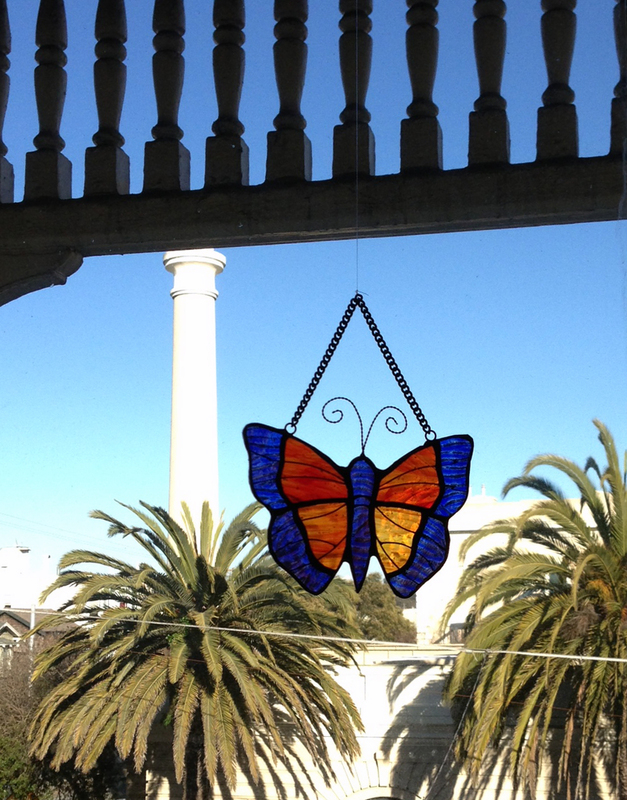 Here a gorgeous butterfly we bought at Looking Glass Collage on Upper Haight Street. Altogether with another butterfly, they make our breakfast and lunch times on our dining area much more beautiful.